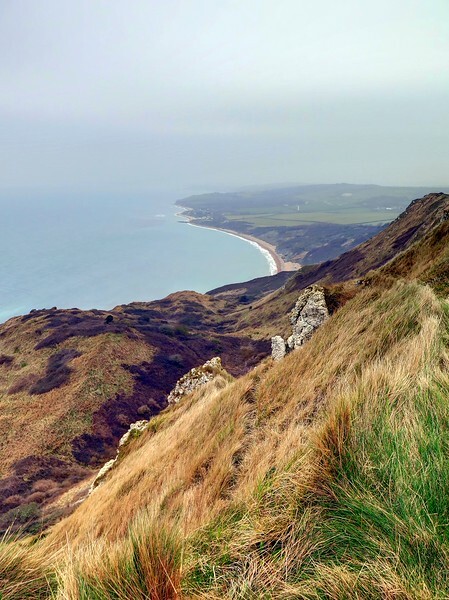 These are some pictures taken on a very pleasant 8.8 mile walk with South Dorset Ramblers from Chaldon Herring (thanks Elaine) on 11 March 2015. After a being sunny early on it soon clouded over and became gloomy with limited visibility, but the rain which was forecast failed to arrive. The temperature was around 8-10 degrees with light breezes, fresh in exposed areas. We went clockwise from the blue flag at Chaldon Herring. The blue line marks the trace as recorded on my phone. 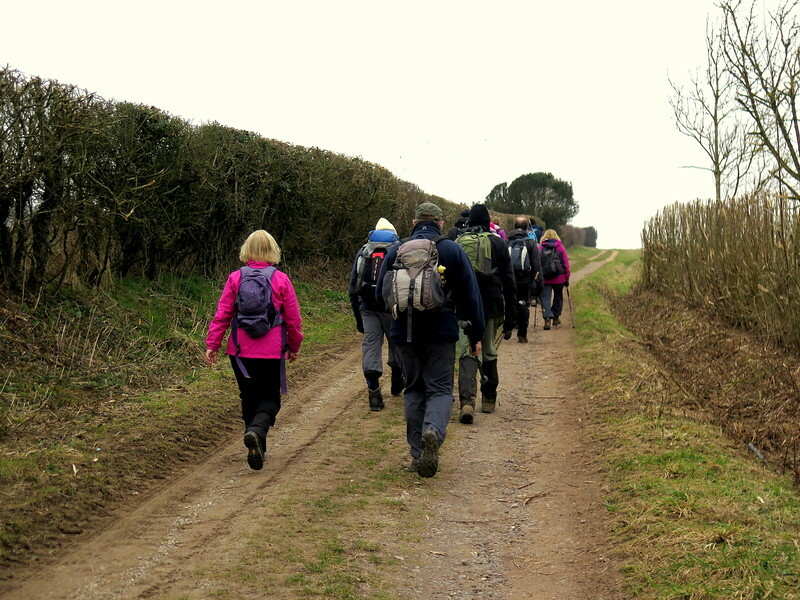 The sky darkens as we trudge South towards Daggers Gate. 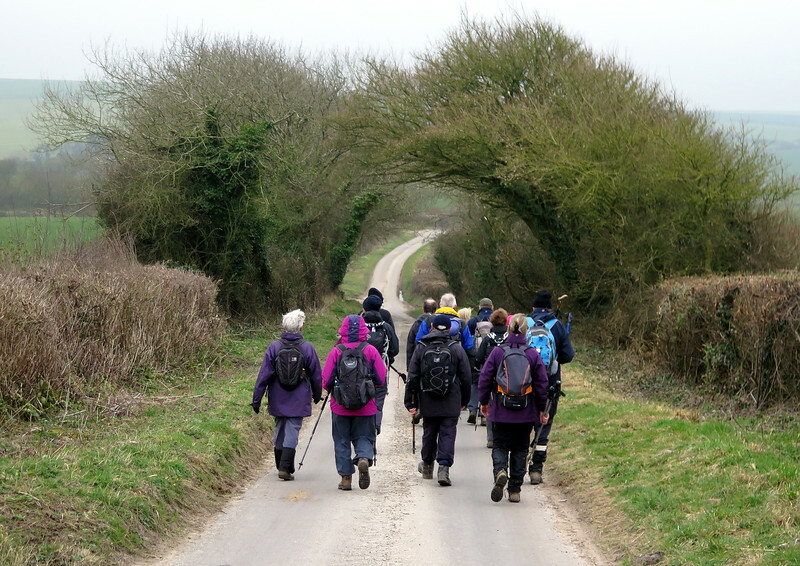 There were 16 of us on today's walk. 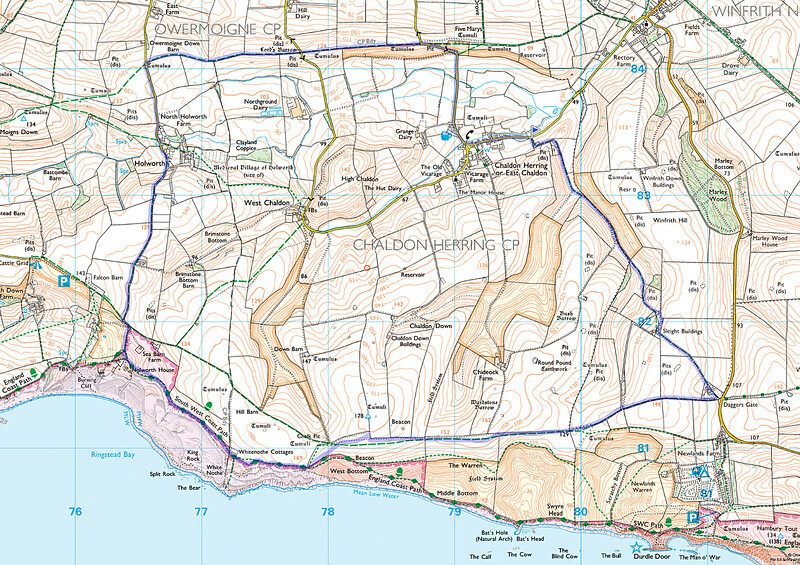 The route takes the higher path away from the roller coaster walk of the Coast Path next to the cliff edges. 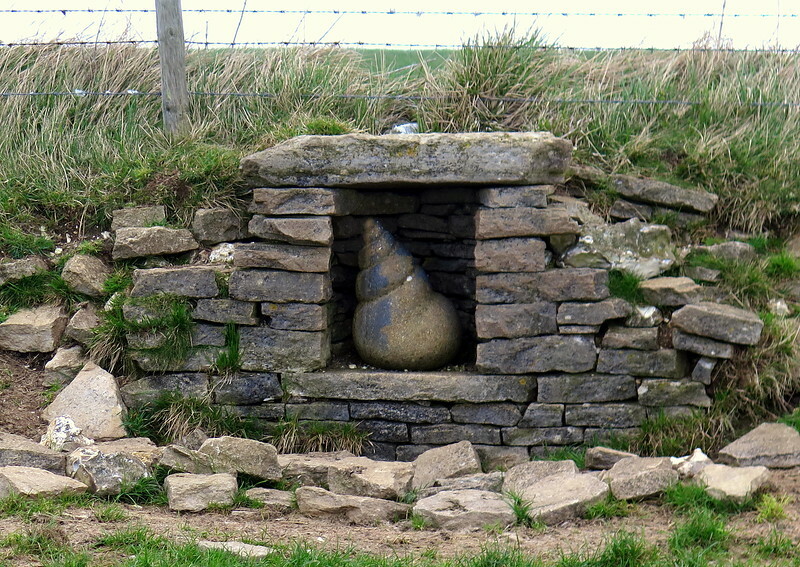 On the Ridgeway Path inland from White Nothe there are these carvings (one has been removed). 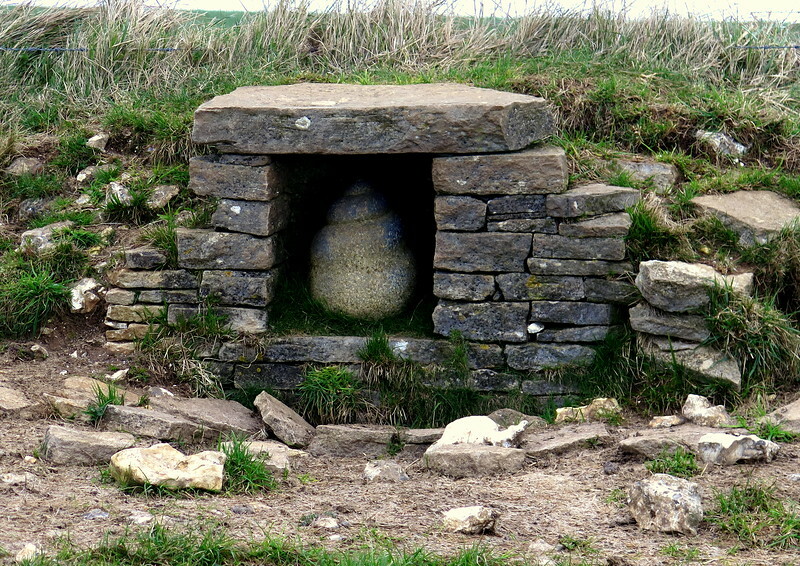 These are stone sculptures commissioned by Common Ground. 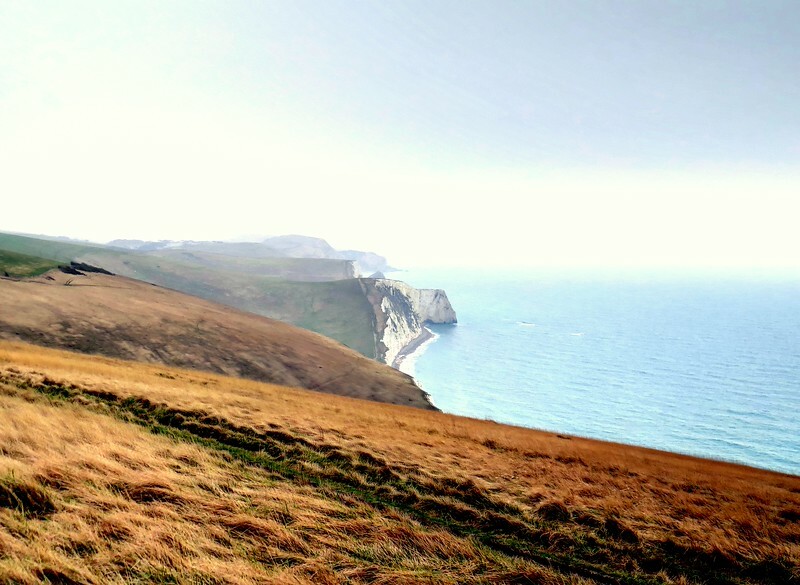 Tucked away in stone 'shrines' along the field edge, carved Purbeck stone shell shapes by Peter Randall Page complement the carved oak wheat-grains in a nearby field by Simon Thomas, and recall that The Warren here was a Celtic field system. 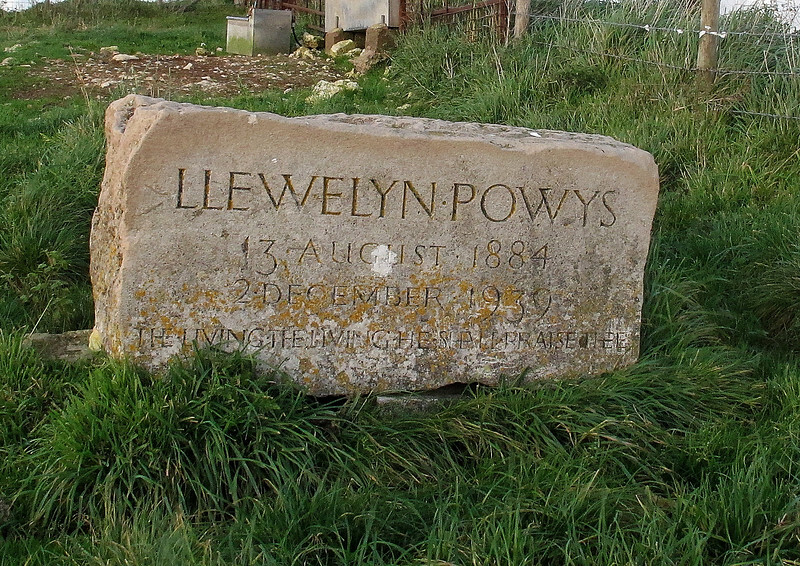 A memorial to Llewelyn Powys. 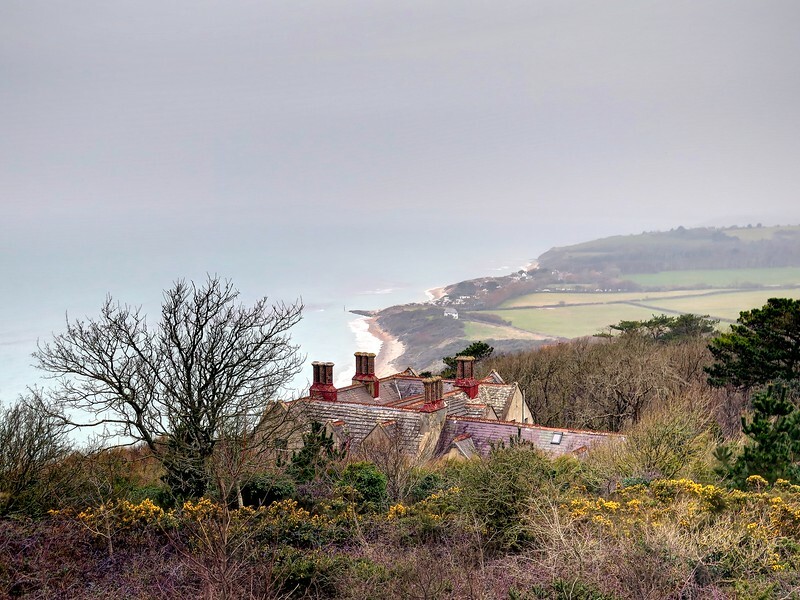 Despite his name he was born in Dorset and was a renowned Dorset author from a prolific literary family. 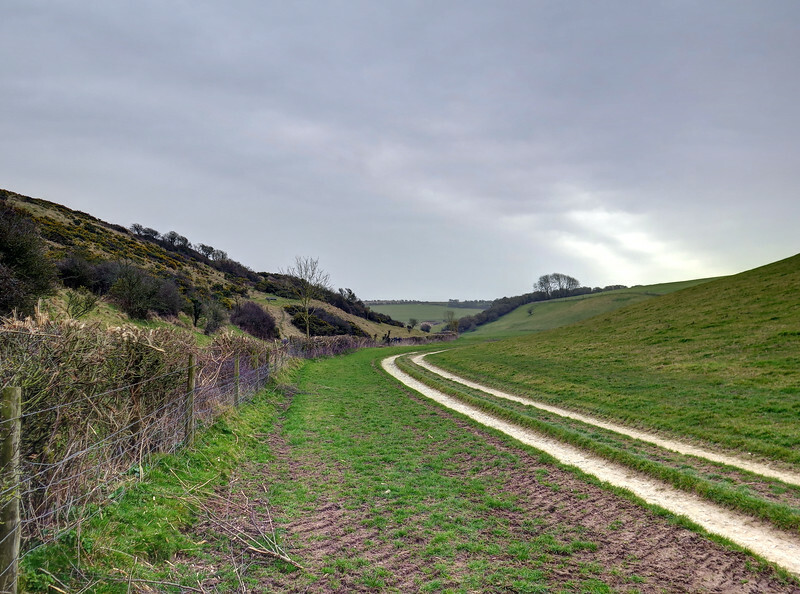 He lived not far from this spot in Chaldon Herring. 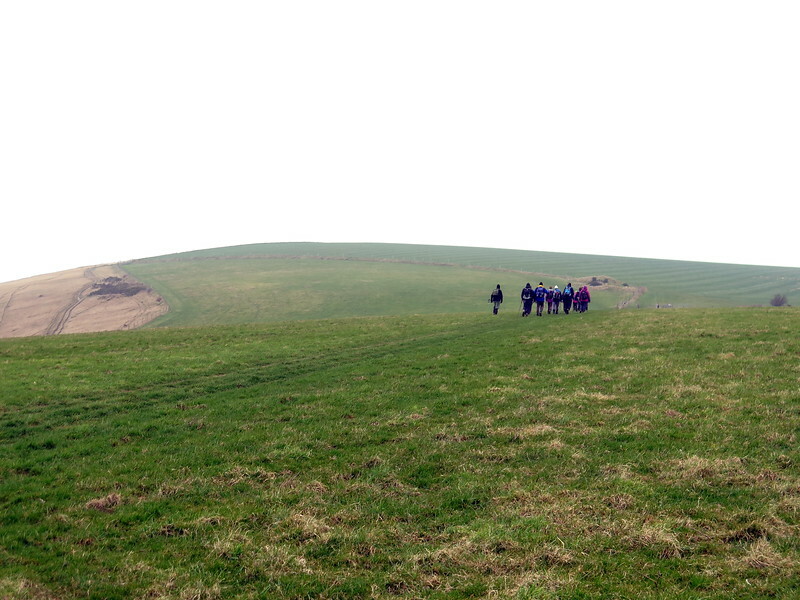 The group marches on towards White Nothe. 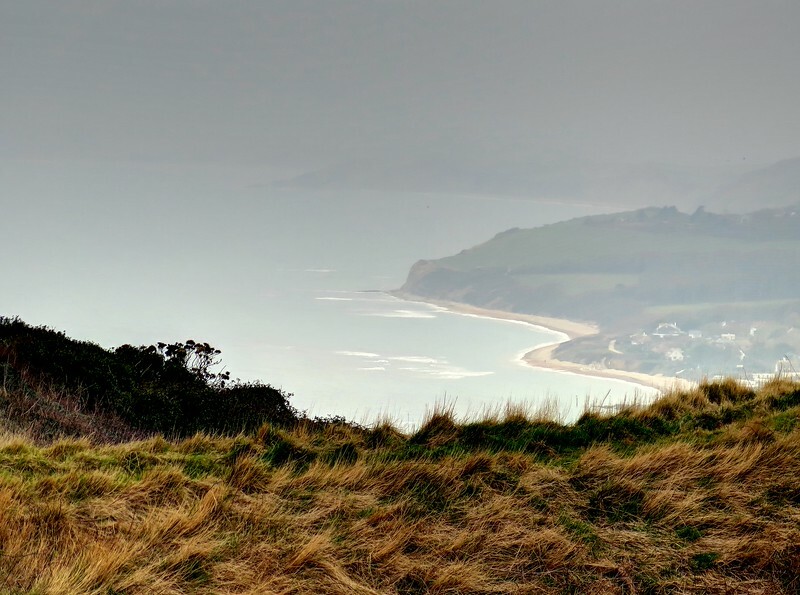 Looking over Ringstead Bay from White Nothe. Holworth may have been where John Keats spent his last night in England before sailing for Italy, and where he wrote the final version of his poem, ‘Bright star’. 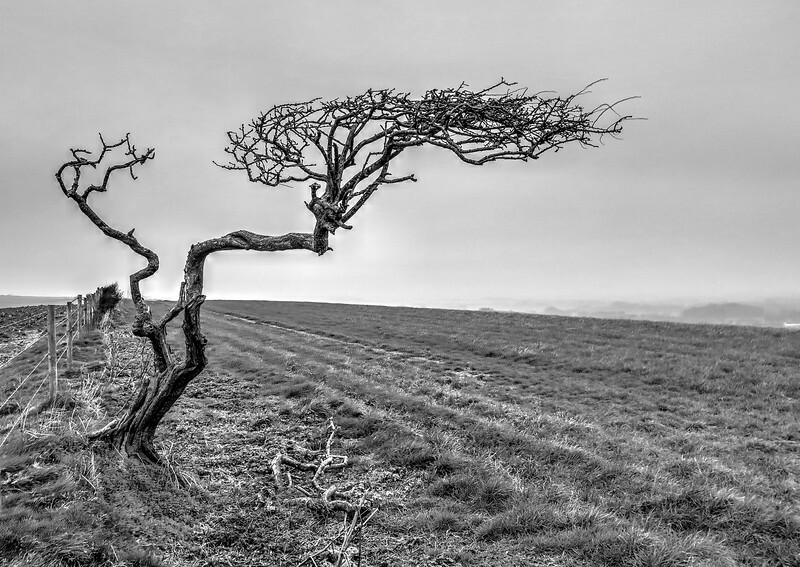 A splendidly wizzened Hawthorne tree up on the ridge. 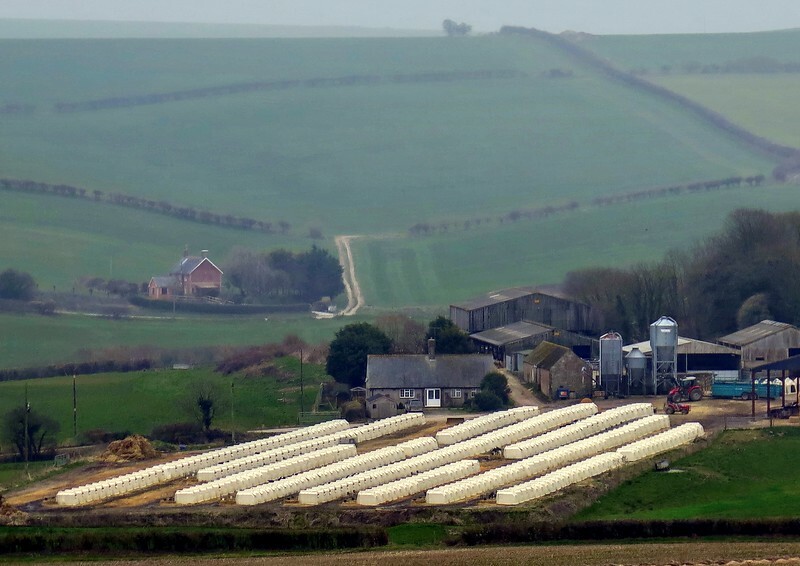 Rows of pig arks at a farm at Chaldon Herring. Near the finish now - still no rain - and in good time for a pint of Otter Ale at the Sailor's Return pub just down the road and round the bend.